Bring the inspiring scents of nature into your home with the No. 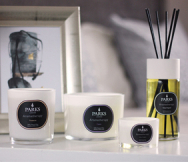 8 Feu De Bois luxury scented candle from Parks, and explore the fine fragrance extracts of cedar, oakmoss and birch, finished with a hint of musky patchouli ¬– a natural aphrodisiac that will transform your home. Our skilled perfumers have perfectly orchestrated a collection of fine fragrance extracts to create this exclusive home fragrance scented candle. To begin, earthy and nostalgic oakmoss marries with the balsam-wood freshness of birch and sweet cedar to create a distinct, complex and woody base note. These ingredients are highly-prized for their rich, earthy and subtly-masculine scents, forming the ideal foundation for a refined and elegant fragrance. Next comes patchouli, a musky and heavy floral fragrance whose feminine edge contrasts effortlessly with the virile scents of sandalwood and oakmoss. Patchouli extract is found in many of the world’s best-loved perfumes, and its musky and aromatic top notes add depth and complexity to the blend¬ ¬– perfectly balancing the fragrance. These wonderful ingredients are hand-poured into 100% natural wax, which helps to deliver pure long-lasting fragrance for longer. Each candle has a burn time of approximately 50 hours, and benefits from our signature clean-burn technology and soot-free wick system, which reduces wastage and helps produce a more natural and true fragrance. Part of the Parks Exclusive collection, our No. 8 Feu De Bois luxury scented candle is delivered in a luxury gift box, making it the ideal gift for that special someone who enjoys filling their home with evocative and inspiring fragrance.